Can you believe spring is here? Soon we’ll be shedding our coats, watching Central Park bloom, and relaxing on our favorite restaurants’ patios. But even with the arrival of spring, you can go on enjoying your fireplace. 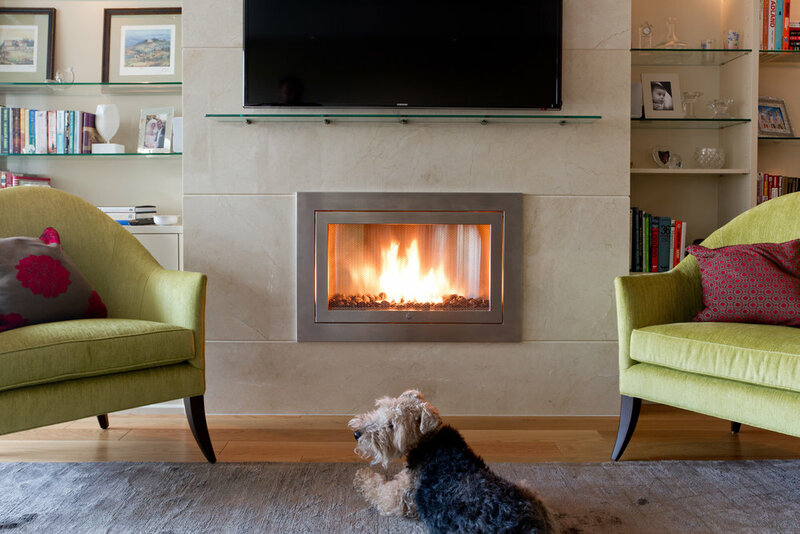 To celebrate the season, here are some of our favorite fireplace designs, perfect for a spring eve. Sit back and enjoy a dose of fresh, bright design inspiration! Project by BFD//Bonnie Fox Design, WW: Wonder Works, Jonathan Held A.I.A. See this project in the Wall Street Journal on our Press Page. The first thing we crave on a spring day? A patio on which to enjoy it. We love this patio’s colorful furniture and spotlight on greenery, and the fireplace provides the perfect amount of warmth for the night chill. Project by Patricia Bonis Interiors & Stanley Michael & Co. Inc.
Classic white furniture paired with pops of colorful accessories give this living room a distinctly seasonal feel - especially with its tall windows and fresh flowers. Beneath the room’s colorful accents, the bright stainless steel fireplace adds a lovely glow. Two words: Spring green! This living room lends itself to the spring season with its fresh accent chairs and bright, central fireplace. As a design bonus, the chairs are upholstered in Greenery, Pantone’s 2017 Color of the Year. This living room has spring design inspiration in spades. Its coloring presents the best of both worlds with a striking combination of bright white and classic spring shades. The statement artwork featured above the ventless fireplace ties the whole room together. Published on March 21, 2017 by Hearth Staff.